Spider veins treatment in Riverview performed by our top rated vein specialists at The Vein and Vascular Institute of Riverview make spider veins disappear instantaneously with only minimal discomfort and without scarring. Based on their extensive experience in spider vein removal, our Riverview vein specialists use sclerotherapy as their preferred method of treating spider veins. Many people think that spider veins are a cosmetic issue. It is important to know that, when you start seeing spider veins on your legs, it is because there is a deeper vascular problem. When your deep leg veins start leaking because their valves are malfunctioning, blood starts flowing toward the skin’s surface, forming spider veins. If the deeper vascular problem that is causing you to get spider veins, is not treated, it can lead to other serious vein diseases such as chronic venous insufficiency, varicose veins, leg ulcers and blood clots which can be life-threatening. Therefore, if you do notice spider veins on your legs, we recommended that you have an examination with a vascular surgeon to find out if your vascular problem is serious. 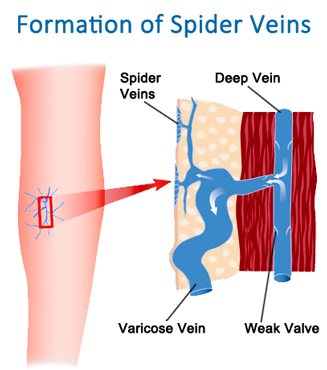 Sclerotherapy injections are the most effective and preferred method of spider vein removal here at The Vein & Vascular Institute of Riverview. During a Sclerotherapy session a concentrated medication is injected directly into the spider vein using a small needle that is similar to an acupuncture needle. Once the injection is performed, the vein closes up and dries out, and this makes the spider vein instantaneously disappear. Sometimes more than one Sclerotherapy session is needed to completely get rid of spider veins on the legs. Our patients always enjoy outstanding results from this treatment. Is spider vein removal safe? As with anything related to the veins, it is very important to have treatment with a vein specialist who is highly trained, experienced and skilled at performing Sclerotherapy. The vein specialist should be practicing under the direction of a Board Certified Vascular Surgeon. Sadly, it has been reported that patients have suffered skin loss, tissue damage, large ulcerations, and even limb loss from vein injections that were performed by inexperienced and unqualified technicians at cosmetic vein centers. At The Vein and Vascular Institute of Riverview, our vein doctors are Board Certified Vascular Surgeons and our vein specialists are highly trained and have extensive experience in spider vein removal. This ensures our patients’ safety during and after vein treatment. Spider veins treatment Riverview patients often ask us if they should have laser or Sclerotherapy for spider veins removal. In our many years of experience and based on our research, laser treatment for spider veins has proven to be painful, ineffective for the removal of spider veins, and can cause scars. It is also much more expensive than Sclerotherapy. Therefore, laser treatment for spider veins is not recommended by our Riverview vascular doctors. Spider vein removal may or may not be covered by medical insurance plans, depending on the individual patient’s diagnosis and medical insurance provider. We will help determine the cost of your spider vein treatment during your initial vein consultation with a vein specialist at our office. To schedule your vein consultation and to have your spider veins removed quickly and safely with our Riverview vein specialists, give us a call today at (813) 999-3992 because you deserve to have great looking legs.